How many people have PCOS? Does PCOS put you at risk for other serious conditions? What is the goal of PCOS Challenge? Where do I get support if I am living with PCOS? How can I sponsor the PCOS Challenge? A: PCOS is a hormonal and reproductive disorder. It occurs because of certain hormone imbalances. With PCOS, a woman’s body secretes abnormally high levels of male hormones (androgens) and this counteracts her ovaries’ ability to make enough of the female hormone (progesterone) needed for normal menstruation. Because of the low level of female hormones, women with PCOS typically have fewer periods than most women (called oligomenorrhea) and sometimes have no periods at all (called amenorrhea). Their periods can also be irregular with lengthy bleeding episodes, light or heavy flows, or frequent spotting. Most but not all women with PCOS get small, pea-size cysts on their ovaries. The cysts are caused by follicles (fluid-filled sacs that contain an egg) that have matured in the ovary, but because of the abnormal hormone levels, were never released. In PCOS, one or both of the ovaries can also become enlarged, sometimes up to 1.5-3 times their normal size. Q: How many people have PCOS? A: It is estimated that more than 1 in 10 women are afflicted with PCOS. Q: Who does PCOS affect? A: PCOS has the greatest impact on women of child bearing age as it is the number one cause of infertility in women. A: No one knows exactly what causes PCOS. Genetics are thought to be a factor, but the environment may also play a part. Velvety, light brown-to-black markings on the skin around the neck and under the arms. Q: What are the treatments for PCOS? A: PCOS can not be cured, but the symptoms can be managed. If a woman does not plan to become pregnant, she can take birth control pills to regulate her periods, reduce male hormone levels in her blood, and clear her acne. One medication to treat Type-2 diabetes, known as Metformin or Glucophage, affects the way insulin regulates glucose and decreases testosterone production. However, doctors discovered that when some women with PCOS take this drug, ovulation can return to normal and abnormal hair growth can slow down after a few months of use. Maintaining a healthy weight can also help women manage PCOS. Physical activity and a healthy diet will help the body lower glucose levels, use insulin more efficiently, and may restore normal periods. Q: Does PCOS put you at risk for other serious conditions? A: Women with PCOS experience a combination of symptoms that can lead to other serious conditions such as obesity, depression, heart disease, diabetes, and infertility. In fact, PCOS is the #1 cause of infertility in women. Q: What is the goal of PCOS Challenge? A: The PCOS Challenge online and offline programs provide fitness, nutrition, and mental wellness coaching from leading experts to help women who struggle with PCOS symptoms regain their confidence and completely transform your lives. By participating in the program, women not only have the opportunity to create new, healthier bodies, but also success habits that can last a life-time. The offline programs will be provided initially in the Maryland, DC, and Northern Virginia area and eventually expanded nationwide. Q: Where do I get support if I am living with PCOS? A: The PCOS Challenge Support and Social Networking Site (PCOSChallenge.com) provides information on PCOS diet, weight loss, infertility, and treatment solutions. Individuals can learn about PCOS, understand its symptoms, connect with other women, share experiences, and join the fight against PCOS. The weekly PCOS Challenge Radio Show, produced and hosted by Sasha Ottey, is designed to inform people about Polycystic Ovarian Syndrome and other related diseases and conditions. Experts interviewed on the PCOS Challenge Radio Show provide advice, support, and their insight to help women and their families overcome PCOS. Past show topics include: fitness, nutrition, complimentary and alternative medicine. Upcoming shows include infertility, adoption, help for the uninsured and under-insured, gynecology, diabetes, heart disease, interviews with leading PCOS research organizations, drug manufacturers, and women living with PCOS. The PCOS Challenge local offline support groups are open to women with Polycystic Ovarian Syndrome living in the Maryland, DC, and Northern Virginia area. Members gather once a month with organizer Sasha Ottey at various locations in the MD/DC/VA area to share experiences, listen to guest speakers, and discuss PCOS related topics including information from the PCOS Challenge Radio Show and websites. 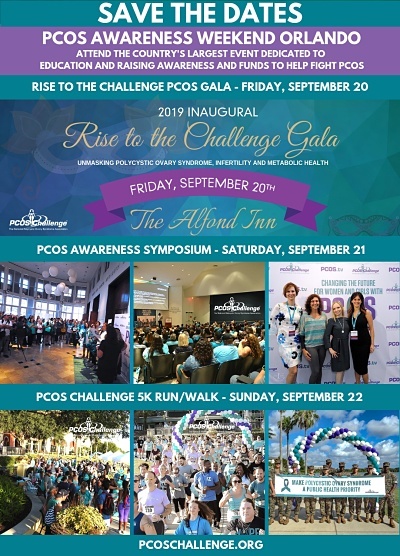 The PCOS Challenge online and offline programs provide fitness, nutrition, and mental wellness coaching from leading experts to help women who struggle with PCOS symptoms regain their confidence and completely transform your lives. By participating in the program, women not only have the opportunity to create new, healthier bodies, but also success habits that can last a life-time. The offline programs will be provided initially in the Maryland, DC, and Northern Virginia area and eventually expanded nationwide. Q: How can I sponsor the PCOS Challenge? A: For more information on sponsorship and advertising opportunities with PCOS Challenge, please complete the information request form on our Sponsorship and Advertising page.